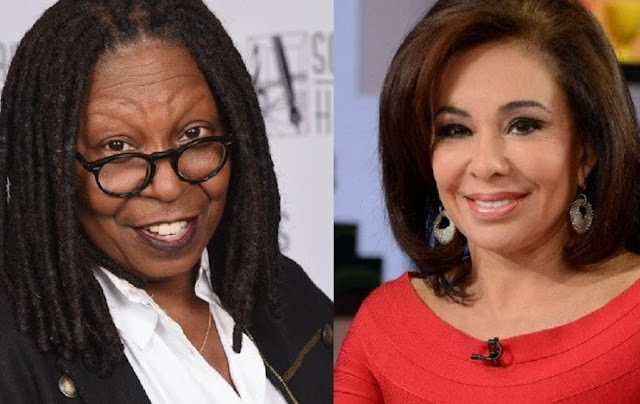 There was a bit of drama between Whoopi Goldberg and Jeanine Pirro on Thursday’s segment of The View. The Fox News host had stopped by to promote her new book, Liars, Leakers, and Liberals: The Case Against the Anti-Trump Conspiracy, and things started out normal. Pirro defended everything Donald Trump, blaming Barack Obama for basically any current problem in our country. But the fireworks started when Pirro mentioned “Trump Derangement Syndrome” and appeared to point at Goldberg. “Did you just point at me?” Goldberg asked. “How long has the deep state been there and who’s running it?” The View host asked. “Welcome back. So, you saw me do something I very rarely do. I very rarely lose my cool and I’m not proud of it, I don’t like it,” she said to the camera.